Can you imagine, life without music? It’s simply unthinkable for many of us. Today our favourite songs and playlists accompany us wherever we go; usually stored in our smartphones, tablets or notebooks. And our music is always accessible to us, whether we are wearing headphones while jogging, listening in the car via Bluetooth and of course within the four walls of our own home. In doing what they do best, Häfele hits the market with their newest development – Loox Sound System 105. This innovative sound system allows you to design and build customised furniture with built in sound, which is sure to impress the music loving clientele. 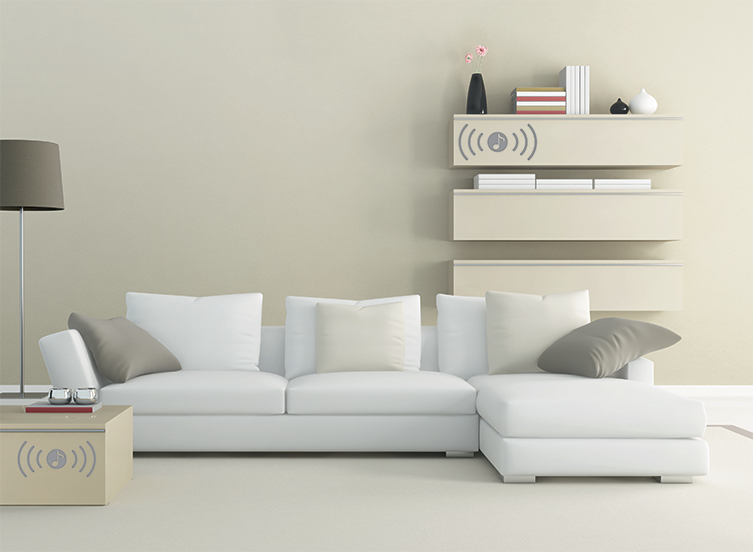 The Loox Sound System 105, is an invisible sound system that is ingeniously developed to be installed into furniture pieces. A Bluetooth receiver with an integrated exciter (sound transducer), are neatly encased in a specially designed compact body. This sends vibrations through different surfaces, transforming every piece of furniture into a sound conductor (speaker). Even at such an early stage in the development, the Loox sound system 105 perfects the new technology. To make it even smarter, those already familiar with the Loox system have it even easier. The Loox Sound System 105 is designed and built to suit the plug and play Loox Driver. Now you can combine the excitement of sound with the ambience of Loox LED Lights and only have the one driver to install.